I am running Wirecast 12.0 with 2 PTZOptics NDI cameras. I have one monitor set up for control and switching, one set up to monitor the live output and one with multiple windows to show my various sources as well as my live and preview feeds. I officially ran the system during our morning worship service for the first time this past Sunday. During the service, the two camera sources froze repeatedly so that the video was static in wirecast. I think the control from the PTZOptics IP controller still worked, however. Rebooting the cameras would bring everything back online for a short time. Lastly, I closed the multiviewer monitor that displayed my various sources and the sources no longer froze. I checked the computer processor speed when the sources froze and everything seems to be running well. The computer system I am using is new and meets or exceeds the specifications given by Wirecast. Does anyone have an idea of what the issue might be? Multi-Viewer is heavily GPU dependent. So you'd need to test for that. have one monitor set up for control and switching, one set up to monitor the live output and one with multiple windows to show my various sources as well as my live and preview feeds. Which means your GPU is running three monitors. Perhaps your GPU is stressed. This may indicate your GPU is also involved in decoding the IP cameras. Or it may well be coincidental. You'd have to test for that. CraigS Thanks Craig! I’ll take a look and see if that was is the issue. I ran the task manager on Sunday when the problems occurred and don’t remember any issues with the GPU but not sure that I specifically looked at that. Gerry Poston You may want to post your complete config and system specs. Perhaps Multi-Viewer and IP cameras are coincidental and one may not really impact the other and it's something else happening concurrently. I ran the system again yesterday and am still having the video feed from the cameras freeze up occasionally. Rebooting the cameras and restarting wirecast temporarily fixes the issue but then it happens again some time later. I have one display that shows all of my sources and I left that display turned off, but that didn't seem to help. One additional bit of configuration information: I am streaming to facebook live as well. So it may not be Multi-Viewer then if I understand you. It's possible the monitoring is completely coincidental to the issue. Reset Wirecast Preferences. 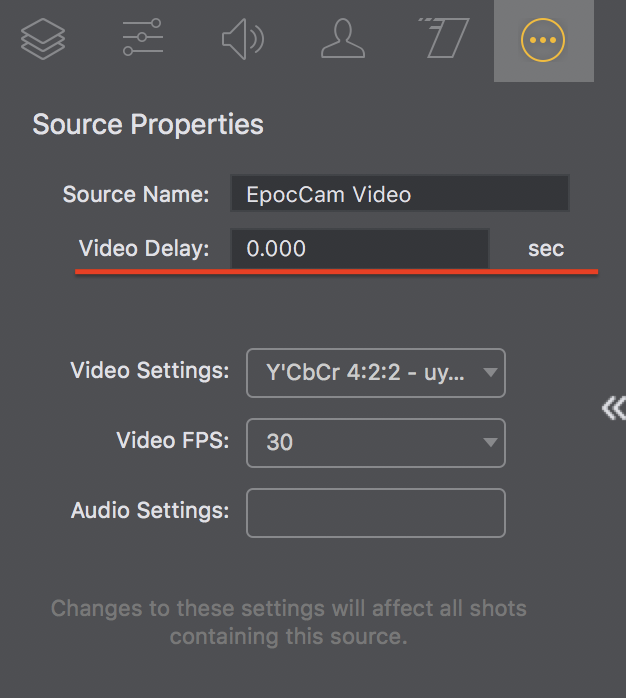 Wirecast > Help > Send Support Information but select lower left Reset Preferences. Use only one monitor (remove the others from the computer entirely). Create a new document using only the two IP cameras and only do a local recording. I did as you suggested above and ran the system last night for about an hour and a half. I didn’t experience any video freezing issues and everything seemed to work some better. There was a noticeable difference of the video lagging behind the audio. My audio comes straight off of my mixer used in the sanctuary. Should I have to delay the audio coming in or should the video be coming in faster? Why should I try next? here was a noticeable difference of the video lagging behind the audio. 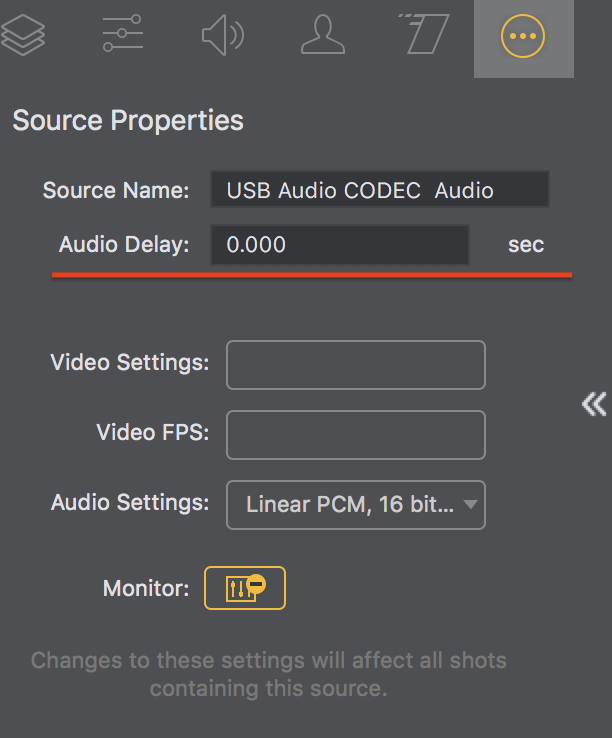 That's not too unusual which is why we have the option for video or audio delay per source. Basically different types of sources can have decode latency and also different signal paths can also result in one timing different than another. In Wirecast you delay the video and audio of each source individually. It can take a bit of testing to get them lined up. The control ranges from seconds to thousands of a second so there's flexibility best on the needs and types of sources. thanks Craig, I can give that a try. Based on these most recent results, what do you think might have been causing the video feed to freeze? I was using new blue titles as well as streaming to FB when it occurred before. Maybe one of those is hanging up something in the software? Gerry Poston NewBlue might be using significant GPU resources which might have affected things. Some users are recommending they run Titler Live on a separate computer and use NDI into Wirecast. Of course one needs a second computer to do that. CraigS Thanks! I’ll try it without new blue and see what happens. Gerry Poston You're welcome of course. Let us know.